Our resident Chimney Expert here at Turner Baker is Edward Turner. He is passionate about chimneys and has over 15 years’ experience in the industry. But what makes him an expert on chimneys?? Read on to find out…..
Tell us a bit about yourself?? 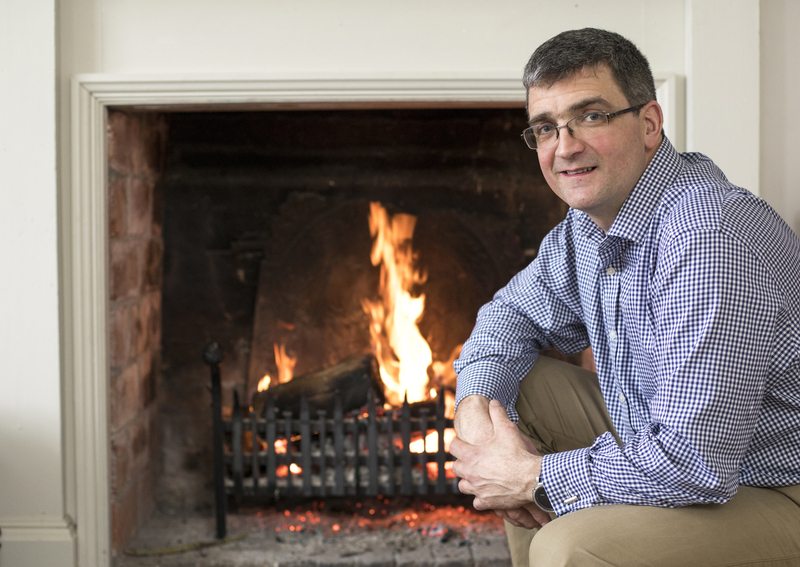 I have been in the chimney industry for 14 years as a Director of Turner Baker ltd. Before that, I was apprenticed to my Uncle who ran the chimney business before me, so chimneys have been in my family for over 40 years. What qualifications do you have?? Well, there are no qualifications that are specific to the chimney industry. However, I have a first class engineering degree from Newcastle University and an ‘A’ at A’ level in Physics, both of which have stood me in good stead and provided me with the tools that I need to understand the thermodynamics of a chimney. Why are you ‘passionate’ about chimneys?? There are a lot of elements involved in making a chimney work efficiently. Some things which may be considered minor may have a huge impact on the way that a chimney works. For example, the direction the wind comes from, the position of the stack and the size of a chimney pot all play a part. Sometimes when I am asked to establish why a chimney doesn’t work properly I feel like I am trying to solve a mystery puzzle and I enjoy the fact that every job is different. I also like to enjoy the end result of a chimney that works well, a warm fire or stove in a home or pub or hotel is so welcoming. What are some of the more interesting challenges that you face? Chimneys on a heritage property can be a particular challenge as it is not always obvious which fireplace leads to which chimney stack and what route they take. Chimney stacks have always been designed to ensure that the way that the property looks from the outside is pleasing to the eye. That means that the flue leading from a particular fireplace may take a very unorthodox route to get to the chimney stack. We can use old architects’ plans to establish which way a flue travels, but if plans aren’t available we have to use transponders and map the route ourselves. Is most of your work on heritage properties?? No!! 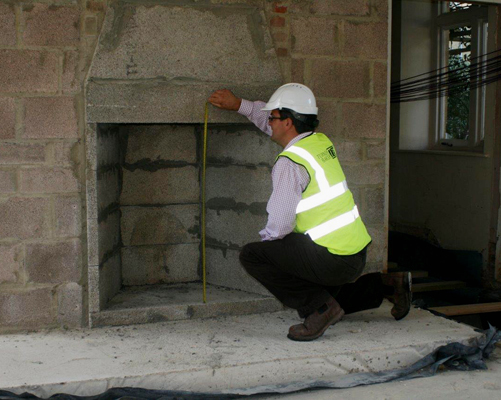 I work very closely with Architects and provide a design service for chimneys and flues on new properties – the architect may specify where in the property they want the chimney to be and then I provide the sizes and drawings to make sure the chimney works properly and conforms to building regulations. It is amazing the number of calls I get at the beginning of autumn from homeowners with a new property saying that their open fire or stove doesn’t work. I am trying to improve this by working with architects and building companies at the beginning of the process. Hopefully, this will ensure that the chimneys are built correctly and we won’t have to sort out something that doesn’t work after the property has been finished and the owners have moved in. There is nothing more disappointing than thinking you are going to enjoy a fire in your new home for the first time only to find that you are sitting in a room full of smoke. What advice would you give to someone who wants to re-establish a flue that has been unused for years?? Firstly, get the flue swept by a professional chimney sweep. Then get a professional company, like Turner Baker, to establish the condition of the flue by carrying out the appropriate tests and providing you with a full written report. This will tell you if the flue is safe to use and if the fireplace draws well if you are intending to use it as an open fire. Any work that needs to be done to make the flue usable will also be highlighted. Tell us about a typical day?? There is no such thing as a typical day – I spend a lot of time in the car driving all over the country attending client meetings and viewing different properties; I also have to spend time in the office writing reports and doing the design work. I am lucky that I get to see a lot of places from an unusual vantage point – not many professionals spend as much time on a roof or in an attic as I do!! What do you enjoy doing when you are not busy with chimneys?? I am married with 3 children so family time is very precious. I also enjoy gardening, cycling and sitting in front of a warming fire on a cold winters evening. And finally, open fire or wood burning stove? ?